We call this game #rematch and for good reason. 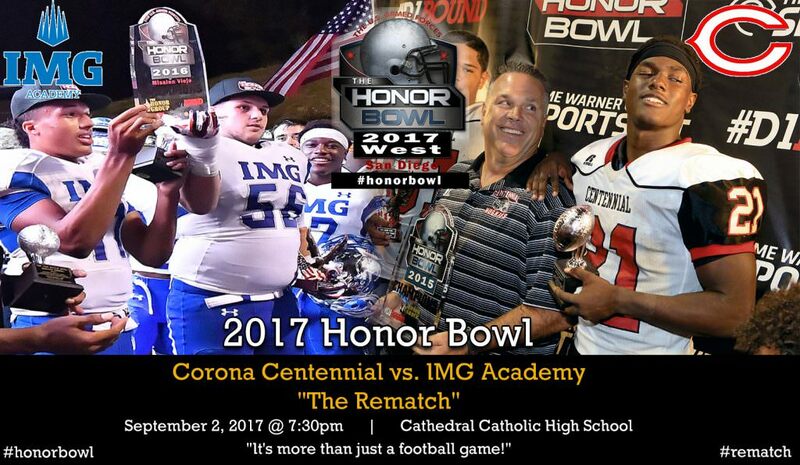 Last year’s finale in the 2016 Honor Bowl has been considered to be one of the nation’s best High School football game – EVER! Both Coaches said they wanted to do it again and here we go! Head Coach Kevin Wright will bring his Ascenders from Florida again after compiling a 14-0 record with a national rank #4 and Florida State #1. He will need to reload his 2017 squad with 28 seniors all receiving D1 athletic scholarships. We have no doubt the Ascenders will bring it, again! Head Coach Matt Logan has been with the Huskies (National #8, State #3) for 21 years and has built this program into one of the Nation’s finest, consistent with a strong community that supports them. Rising Junior QB Tanner McKee looks forward to his senior year where in 2015 he passed for 3522 YDs w 36TDs. Centennial prepares to play anyone, anytime, anywhere! Get there early because this game is highly anticipated to be another barn burner!